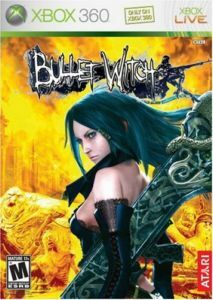 Developed by Japan-based Cavia, Bullet Witch is set on a bleak planet earth in the year 2013 with human kind on the brink of extinction and hideous demons creating a tidal wave of destruction and havoc. All hope of mankind's survival rests with Alicia, a beautiful witch blessed with magical skills and a swift trigger finger. Players must guide Alicia in her heroic quest to prevent the decimation of mankind by wielding fearsome weaponry and using her unusual and spectacular powers to manipulate natural phenomena in her environment. Weave astounding magic: with her fearsome arsenal of spells Alicia can turn the city into a sea of roaring flame, cast a deadly meteorite shower, invoke a devastating tornado or assemble a murder of crows to consume all that lie in its path. The advanced physics of Xbox 360 allow for glorious environmental damage, providing the perfect platform for Alicia's spells to be represented in all their majestic cataclysmic glory; be it the catastrophic summoning of tornados to rip through the city, or elegant spells such as her rose throw where the roses' stems lance enemies. 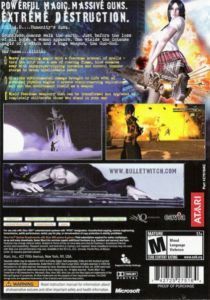 Alicia's hefty staff-like weapon, the Gun-Rod, helps in battle to defeat the hordes of demons by firing bullets created from the souls of her defeated enemies. The Gun-rod can be transformed into an even more powerful weapon to completely obliterate those who stand in her way. Horrific demons come in all shapes and sizes, some causing earthquakes or abnormal weather conditions and others spreading plague and manipulating human minds. Some even have the power to reincarnate the dead as brutal monsters known as Geists. In-game demons are designed by one of Japan's most prominent creative talents in the field, the globally acclaimed Yasushi Nirasawa, who has been responsible for designing movie creatures and action figures as well as creating his own range of figurines.